This year's event marked the first full tournament played with the L2 Design Group Deluxe Edition. There were 20 participants, including four past champions. 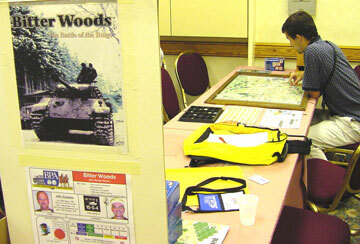 All gamers volunteered to play the 6-turn tournament scenario with the use of chess clocks or possible adjudication. Adjudication did not prove necessary. The 22 games played were equally divided between German wins and losses, attesting to the scenario's apparent play balance. Some of the more notable games are mentioned below. In a third round game between veteran Bob Ryan and newcomer John Popiden, John looked to have the game won with Bob's German forces too distant from their VP hexes. Utilizing a clever Angriff Aus Der Bewegung (Attack on the Move), Bob propelled a full strength panzer division forward into the VP town of Noville. The defenders were too strong for John to muster a counterattack. The capture of Noville gave Bob the necessary VP edge to win the game. In another third round game between past champs Phil Evans and Randy Heller, Randy placed the Peiper KG in reserve for mechanized exploitation on the 17AM Peiper breakout game-turn. He gambled by attempting a dice roll infiltration through enemy zones of control, which proved successful. The resulting move placed Peiper in the VP town of Stavelot. At this point, the American player acknowledged the difficulty in dislodging the KG before the arrival of reinforcements, both German and American, and tossed in the towel. The semi-final round witnessed a hard fought game between Forrest Pafenberg as the German player and Bob Ryan commanding the American forces. Forrest had the game just about locked up until a timely next-to-the-last game-turn move by German mechanized forces placed in reserve, which did an end run on the American forces defending behind Vielsalm. This resulted in the secure capture of Parkers' Crossroads, effectively ending the game in a German victory. The final round proved to be one of the more interesting of the tournament. Bob's Americans rebounded well from the first turn combat results. Randy's attacking German forces were repelled at Hofen, did not build the bridge in front of Clervaux, and garnered four counterattack results. On the second turn, a defending American unit's retreat was "channeled," resulting in an open road to Bastogne. But the blown bridge in front of Clervaux limited German exploitation. Bob cleverly responded by sequestering the one German mechanized unit that had broken through and began a forward defense, trading units for time. On the 17AM game-turn, eight American units were eliminated in combat. On the final game-turn, Randy broke up the KG Peiper unit by utilizing the Peiper Alternative Variant and moved the Peiper Leader unit next to Trois Ponts to prevent an American artillery unit from providing defensive fire. A bombardment was attempted on the VP town of Stavelot, but failed to shock the defenders. This brought an end to the German player's attempts to pull the rabbit out of the hat and earned Bob his 7th piece of WBC wood. Congratulations to Bob Ryan. He is the first player to win more than one WBC Bitter Woods Tournament, and the first to do so back-to-back. He has proven himself to be the current master of the game.